We did some light fixture “switcharoos” this weekend. I’ve been wanting to change out our entryway light ever since we have lived here and just could never decide what to do with the space. It’s not my style, but it could actually be pretty cool in the right room. If you were more of a “shabby chic” decorator, I could see it fitting in. So, I’m going craigslist it. 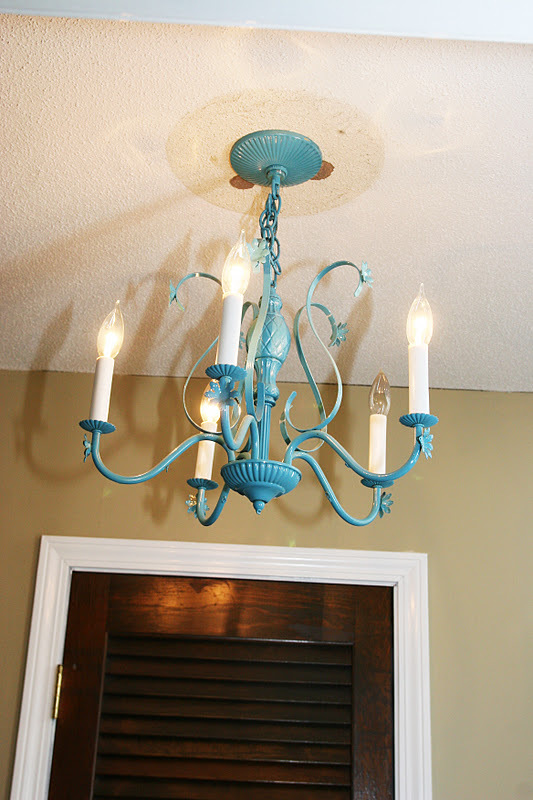 We decided to replace it with the chandelier that I painted teal and was hanging in our dining room. This was the original chandelier that came with our 1960’s house and it was brass and pretty ugly, but once I spray painted it teal, I fell in love with it! Now it sits in the entryway! 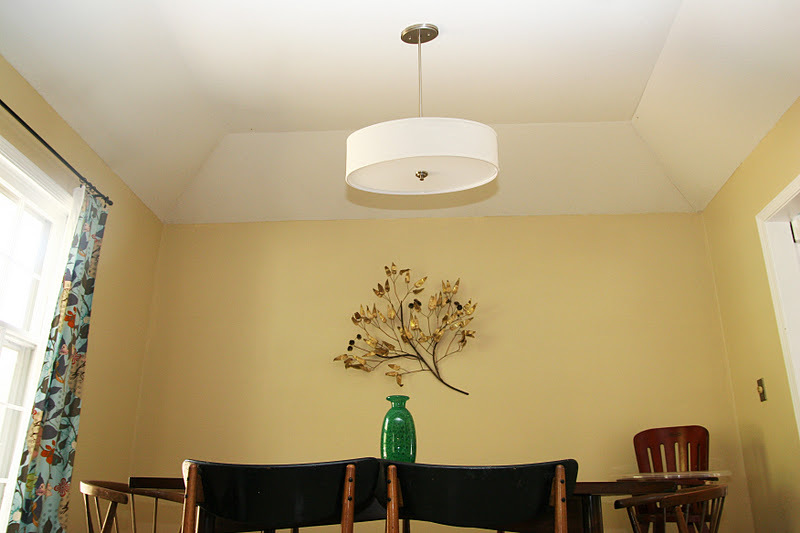 It looks cute there…except the ugly brown circle from the old light fixture. I will be touching it up in the next few days with some ceiling paint! So, what did we do for the space in our dining room? 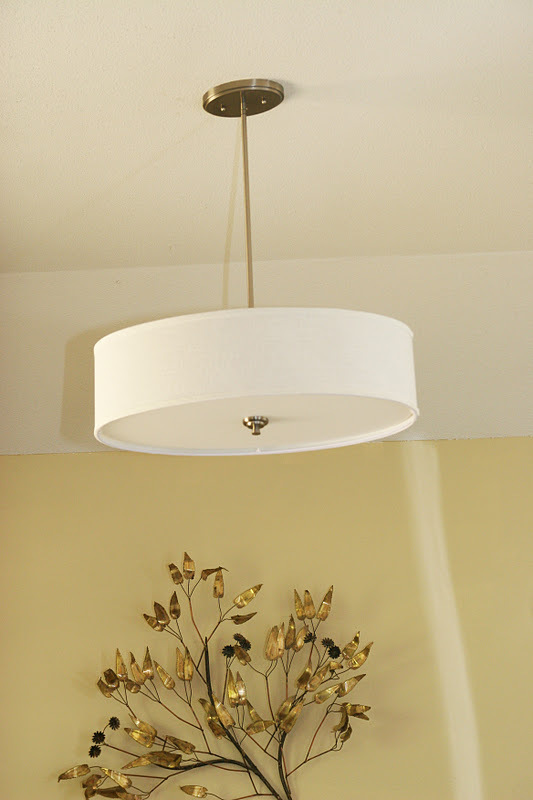 Well, I’d been wanting to put in a drum pendant light fixture and I happened to find one on clearance that worked perfectly!! Yay! The oblong shape is perfect for the shape of our table. And once we paint the dining room a darker shade (I’m still leaning towards teal) it will pop even more! However, the dilemma is how far above the table to hang the light. At first, it was way too low, so I made Reid undo the whole thing, lift it up and rewire it all. But, now I’m ashamed to say I think it’s too high. 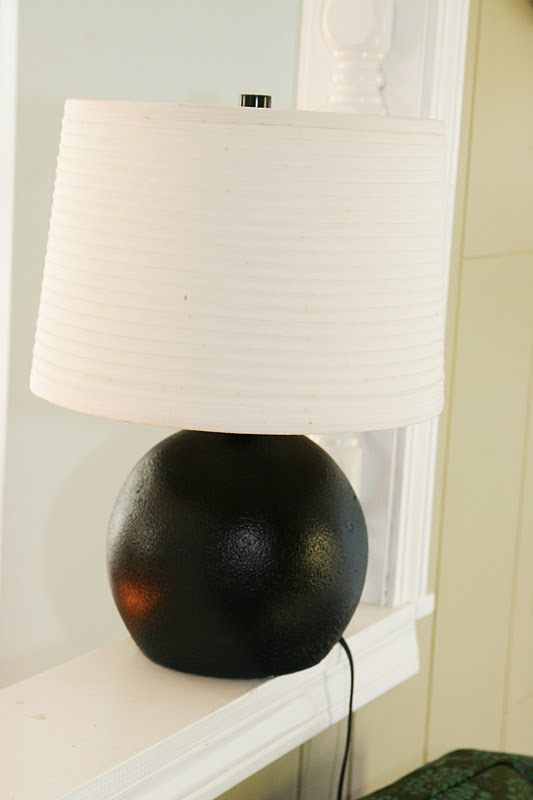 So, I spray painted it oil rubbed bronze and put the white shade back on, and now it’s simple and modern! We moved it to sit on the ledge between our kitchen and living room. 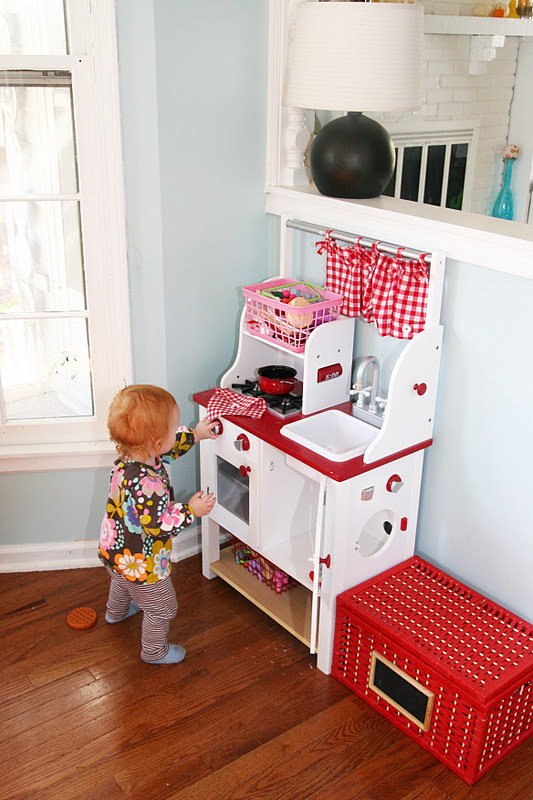 We also moved the little play kitchen to be in the “big” kitchen, hoping it will help occupy the girls during meal prep time! Now that I look at the picture, I’m thinking that lamp could possibly be pulled down by a certain 14 month old, so I’m going to move it to a safer spot! oh, how i wish i could take that light fixture off your hands! but i just don't think it would go in my house. someone will love it though!! 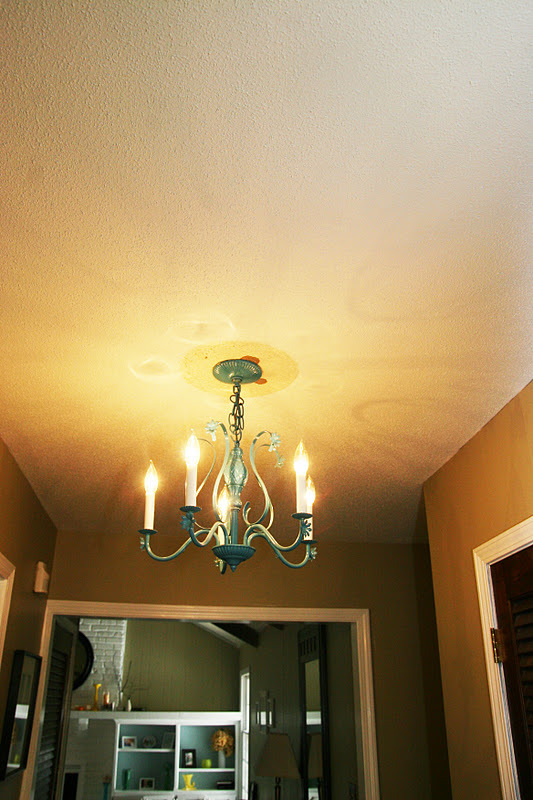 you could always use a ceiling medallion above the chandelier if you don't want to paint. 🙂 i got one in the old house to cover up a very noticeable paint difference and liked it so much, i brought it to Topeka with me. they are fabulous! !